With this purchase you will receive a rainbow of one of each color of 4oz Sunsational, that's sixteen total daubers! 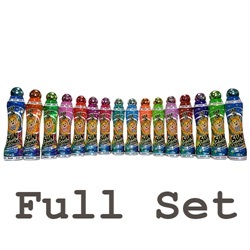 Let's not forget the discount you get with this purchase when compared to a single dauber! Brighten your Bingo with the high-quality brilliant ink of a Sunsational today! Same Sunsational, smaller package. These daubers are 4oz (110ml) in size with a standard tip that is easily removed and replaced.